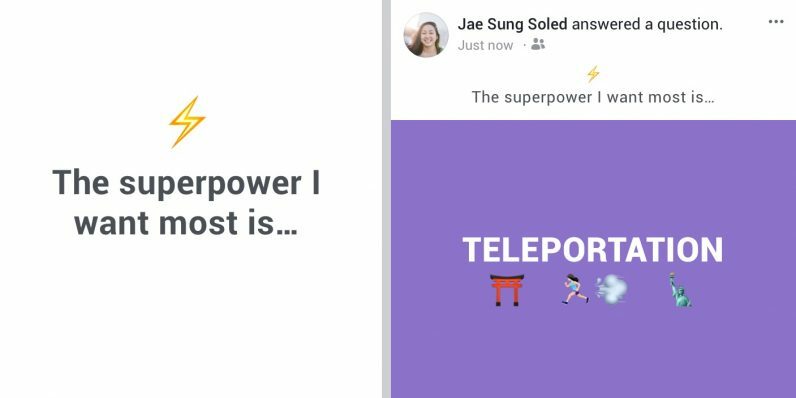 Facebook today announced it was releasing a feature called Did You Know, which allows users to answer pre-written questions which their friends and followers can then see. To use it, open a new status, and, under the list of things you can add to the status (such as requests for recommendations or location tags), click “Answer a Question.” Then you’ll be given a question to answer. Once you’ve decided which question you want to answer — you don’t get to enter one yourself — you can choose the background color, as with any status, and post it. Is it just me, or does this feel like the social media equivalent of the first day in a new language class? You know the day I mean, where you’re all parroting mindless facts about yourselves because you don’t know how to say anything more interesting — “meine Liebingsfarbe ist Lila” etc. Something about it feels kind of off. It almost feels as though Facebook is trying to capture the magic of those old Facebook statuses where someone would put a question to their followers, their own answer, and an imprecation to “answer, then repost to your profile so you can learn all about your friends — no answering without reposting!” Does anyone still do chain statuses like that anymore? The difference is, this doesn’t have the same informal social element — it’s just, again, the user spouting random personal facts. I don’t really foresee this becoming a mechanism through which deep discussions happen, though I’d be happy to be proven wrong. For anyone who does feel like spilling their guts about their favorite superhero, the feature is now available to everyone on iOS, Android, and web.